Please notify me when Elite HI is in stock. What Makes the Elite HI PEMF Therapy Equipment Unique? Solid State Technology delivers reliable, consistent and maintenance free performance. The efficient digital control panel is operator friendly and easy to use. Liquid Cooled applicator ensures that the device does not overheat even during prolonged use. The NexGen Elite HI is designed for heavy use throughout the day and for extended periods. Adjustable Arm with detachable applicator for hand held applications. Using the 3 point adjustable arm, practitioners can precisely place the applicator where desired. The NexGen Elite HI applicator offers a reach of up to nine feet once detached from the adjustable arm. Clinical Grade design using advanced technology with high quality components for long lasting use. The highly functional design allows the practitioner to move the device freely about the office. Auto Mode and Memory Mode. These two primary options of the Elite HI give the practitioner the freedom to choose which mode is best for the patient. Memory mode gives the practitioner the ability to pre-set the device for 5 specific programs. Pulse Train Adjustment. The Elite HI can be set to run continuously or for varying pulse times. This makes it easy for the practitioner to adjust the pulses according to a patient’s individual needs. 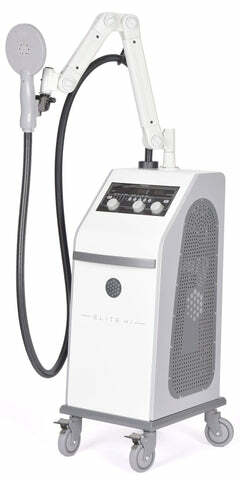 The Elite HI systems are most often used in the offices or clinics of chiropractors and homeopathic physicians. The Elite HI is recognized by the FDA as a wellness device and the NexGen Elite HI product is officially registered with the FDA.